The PE51U is a SxS memory card adapter that supports 'Hot-Swap' on Windows and Macintosh. The proprietary driver makes it possible to swap memory cards without restarting the system. The RE51U is fully compatible with Sony XDCAMEX. The SxS memory card will be recognized as a standard storage drive on both Windows and Macintosh. Fully compatible with SONY SxS Flash Memory Card. Support Plug & Play, Hot swap on Windows and MacOS X. Bundled with originally developed RATOC Card Service Driver. It brings media exchanging like video tape. High speed Read and Write. Works as Standard Drive on Windows and MacOS X. Heavy duty. 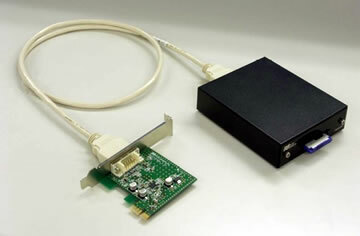 Use tough ExpressCard socket and PCIe extension cable. Windows PC PCI Express slot equipped. The PE51U supports all major non linear video editing software. Please refer to the link below for details. Supported Computer Windows PC PCI Express slot equipped. Microsoft Windows® is a registered trademark of Microsoft Corporation in the U.S. and other countries. Macintosh® is a registered trademark, and Power Macintosh, Mac OS 9, Mac OS X, FireWire are trademarks of Apple Computer. All other products, services, names and registered trademarks are trademarks of respective companies. XDCAM-EX, SxS, SxS Pro is a registered trademark of SONY Corporation. Word Mark and Logo Mark of ExpressCard is a registered trademark of PCMCIA. Trademarks are used under license and/or permission to Ratoc Systems International, Inc.